When you were taught microbiology (as every last one of you should have been), you were probably shown a microbial cell structure like this one from a standard textbook. The parts are all there; DNA, membrane, cell wall, flagella, ribosomes, etc. If your micro class was pretty good, you learned about what all the parts do, then you went on to learn how bacteria get energy and carbon, as well as their other nutrition. You were probably told, in perhaps not so many words, that bacteria are just really simple versions of our cells, stripped down and optimized for their niche in the world. If your class was good (again! ), you might even have learned about some of those niches besides us. However, if it was typical, you learned about diseases for most of the rest of the course. Now, learning about infectious disease is very important. As a grad student in med micro, I made a lot of effort to learn the structures and functions of all sorts of toxins, including my favorites, the Superantigens from Staphylococcus aureus. Staphylococcus aureus makes a bewildering array of virulence factors, including things on the surface that protect it from the immune system, and lots of toxins (see above review paper). The order in which these various products are made, and which ones are being made, makes a huge difference in what disease S. aureus causes, whether it is a boil or toxic shock syndrome, or more recently, necrotizing fasciitis (By the way, I've found that as interesting as I think this is, gross pictures are worth at least a thousand words, so click through, if you have a strong stomach!). When I learned about this system, I found out a peculiar thing about bacteria. A million or a billion bacterial cells is not just the same cell multiplied a million or a billion times over. Bacterial cells change and develop over time, especially in the aggregate. In Staph (including the very, very relevant Methicillin Resistant S. aureus), there is a complex system for controlling cell behavior based on the population size and density...especially the density. The system (largely figured out by a very big group of researchers centering around Richard Novick at NYU) involves a peptide ( a short string of amino acids) secreted by the bacteria as they grow. Through a fairly complex mechanism, this peptide is bound by a protein on the surface of the cell, which activates a regulatory RNA molecule (called rnaIII). This regulatory RNA molecule (a relatively rare thing in microbial genetics) is a global regulator of gene expression. What does this mean? It means that rather than a single gene encoding a single protein that does something, this RNA molecule turns on and off a whole bunch of genes, and and that massive change in what genes are being expressed is a major factor in what disease results (the other factors are what toxin genes are present, and environmental factors such as pH, oxygen level, and CO2). The astute reader will wonder what any of this has to do with the title of this post, which is about bacteria as multi-cellular aggregates. Well, see, the Staph stuff is the tease, to get you interested. Now here comes the science. The words I used in that paragraph; population, density, global regulator, are all words used to describe a system called a quorum sensing system. This means that the bacteria act one way when they are sparse, and as their density grows, they act another way. The canonical system was identified as a symbiosis, rather than a pathogenesis, between the marine bacterium Vibrio fischeri and the squid Euprymna scolopes. It turns out, after a great deal of fine work by too many people to name, that this system revolves around the production of a chemical called an acyl-homoserine lactone (don't worry about it!). Like the peptide I mentioned before, this is secreted by the bacteria as they grow, and it binds to a receptor (this time in the cell, because these can pass through membranes (maybe)), triggering responses in genes regulated by the system. In the V. fischeri / E. scolopes interaction, this results in bioluminescence (Finding Nemo, anyone?). In the squid symbiosis, bioluminescence is thought to be a defense against predators, because the light emitted matches moonlight in the visible spectrum, thereby preventing the squid from casting a shadow as seen from below by predators. The astute reader who has made it this far will wonder "what does this have to do with multi-cellular aggregates, or biofilms?" After all, I wrote above about bacteria inside a squid, or in a person causing disease. But they are inside something, not on something, right? Well, your wrong, now pay attention! (kidding!) In fact, it turns out that microbiologists have pretty well been studying the wrong stuff for about the last 100 years, in some ways (we aren't going to take back the Nobel Prizes, or anything!) Most bacteria, in most environments, most of the time, live attached to something, and aggregated with other bacteria. It is a rare thing for a bacterium outside a lab to be floating in a fluid containing free nutrients. This attached lifestyle is called a biofilm. In the last 15-20 years, it has become a major field of study. I even wrote a grant about it! (yeah, I'm pretty proud of myself, why do you ask?) So what does this biofilm thing have to do with S. aureus disease? A lot, actually! 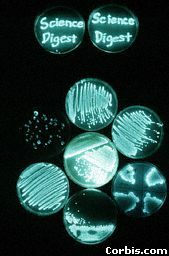 It turns out that many diseases in eukaryotes, caused by bacteria, are caused by them when they form a film on a biotic surface. The biofilm is often a critical stage in the infection. Many hospital infections are entirely based on the formation of biofilms on medical devices or tissues. It turns out (surprise, surprise) that many bacteria have complex systems for controlling the formation of these biofilms, with some significant commonalities. In many gram-negative bacteria (like Pseudomonas aeruginosa, bacteria that can cause wound infections and lung infections in cystic fibrosis) the signals that control expression of virulence genes and biofilm formation genes are one and the same, acyl-homoserine lactones. In gram-positive bacteria (like the aforementioned S. aureus) peptide signals are used. These signals in gram positives are important in transfer of DNA between bacteria, uptake of DNA from the environment, biofilm formation, and virulence factor production (at least). I better stop here, but it is a huge, complex story. Just understanding one of these systems can take a lifetime of well-funded research (I hope!). But that last bit there is particularly interesting. The role of horizontal or lateral gene transfer in bacteria; how is this connected to quorum sensing, biofilm formation, and virulence (as well as other things)? That sounds like a topic for next time! New Blog Post? Is he back? New and improved blogger. Will it get me to post? Well, not exactly, but since Tara Smith (of the U. of Iowa and Aetiology) has started a new blog carnival, (tentatively called Animalcules, but maybe to be renamed) I've decided to participate. I don't promise anything more than to try to do it more than once every other week (er....), but here we go!